En 1945 el E-75 fue ideado como un tanque pesado estándar de la Panzerwaffe para reemplazar al Tiger II. Solo existió en planos. The first heavy tank in the Entwicklung series. It has very thick sloped armor, rivaling that of the ST-I, but with one great advantage; it doesn't have the frontal viewport weakspot. Stock it is armed with the inadequate 8.8 cm KwK 43 L/71, but can also use the 10.5 cm KwK 46 L/68 from the Tiger II so make sure to research it before using the E-75, unless you want a terrible grind. Eventually, you will have access to the very powerful 12.8 cm KwK 44 L/55 that packs a sizable punch up close or afar. The E-75 can be used for multiple roles due to its immense armor and great weaponry. Of the tier 9 and 10 heavies the E-75 is one of the slowest, with only the Maus having a slower top end speed. The E-75 has sluggish turret and hull traverse speed, making it difficult to move around. While the E-75 is one of the easier tanks to flank, it is still harder to damage once flanked thanks to its relatively thick side armor. Traversing your hull along with your turret helps you keep up with enemies better if they get too close. Speed and agility aside, it is a versatile tank. You can be a close range brawler relying on your armor and firepower to keep you alive, or you can be a far range sniper with good accuracy and damage. The E-75 is one of the most dynamic heavies of its tier, with thick hull and turret armor coupled with an excellent gun. In situations in which your armor does not hold out against enemy fire, you have enough hitpoints to last a while you're under fire. Upgrading the engine would allow you to keep pace with the battle line in sniping your opponents. With strong armor (especially at the sides, which makes it very good for sidescraping), a powerful gun, and decent maneuverability for its size, the E-75 is a highly capable tank. It looks very similar to its predecessor Tiger II uparmored and upgunned to tier 9. The tank has a very high silhouette, so don't expect to do much hiding. Top gun reloads very slowly so make every shot count and aim carefully before each shot. The turret rotates very slowly so any medium tank can out-circle E-75. The E-75 used to lack transmission hitbox, however it was placed to the front in one of the patches (E-75 is based on Tiger II and its powertrain), so it might suffer engine damage and fire from frontal hits. However it is still less prone to these than other German heavies due to relatively well-armored lower frontal plate, preventing penetrations in the first place. The tank is very sensitive to the splash damage from artillery, not to mention a direct hit. It would be very useful to have the E-100's screens, but in their absence, this tank must rely on agility and engine power. The greatest danger for the E-75 in a direct clash comes from fast tanks. When fighting very strong opposition, "hull down" or "American" tank tactics can be used: hide the hull or even only the lower glacis behind a hill, stones or dead tank and shoot enemies from a distance. One can also "wiggle" the turret back and forth while reloading to make your vulnerable commander's cupola a harder target to hit. The E-75 is a good tank to side-scrape with as well, Especially if you can find a corner where you are leaving your left side behind cover, as that will keep your commanders hatch from being hit at all. The tracks on the E-75 will eat a lot of shots while side scraping, but few of them will track you if you are angled correctly, the tracks will just act as spaced armor. All the guns from the Tiger II carry over and can be installed immediately. The first thing you should research is the upgraded suspension. From there the turret is a great next step, and you can take your pick from there. The E-75 Standardpanzer was intended to be the standard heavy tank to be used as a replacement of the Tiger II and Jagdtiger. The E-75 would have been built on the same production lines as the E-50 for ease of manufacture, and the two vehicles were to share many components, including the same Maybach HL 234 engine. 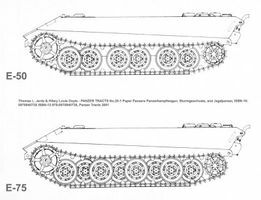 The E-75 would have had much thicker armour however, and in fact compared to the Tiger II the E-75 had improved hull armour all round. As its name indicates, the resulting vehicle would have weighed in at over 75 tonnes, reducing its speed to around 40 km/h. To offset the increased weight, the bogies were spaced differently than on the E-50, with an extra pair added on each side, giving the E-75 a slightly improved track to ground contact length. According to some sources, the similarities between the E-50 and the E-75 went further; they were to be equipped with the same turret and 88mm L/71 or L/100 gun, along with an optical rangefinder for increased long range accuracy (German scientists and engineers had successfully designed a 'schmal' or narrow turret and infra-red lighting and sights for use on the prototype Panther F as the war drew to a close). Other sources however, indicate that the E-75 was to be fitted with the much larger Tiger II turret, which could be adapted to accommodate an even more powerful high velocity 10.5 cm gun.